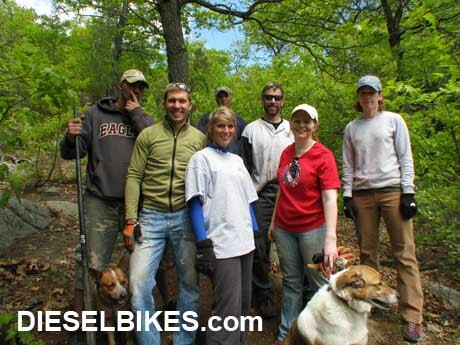 This page contains all trail maintenance projects held by Dieselbikes related to Lynn Woods. The first section below contains information regarding the most recent trail day completed. Further down the page you will find other trail projects sorted by date and year completed. On Sunday May 09, the second Lynn Woods trail maintenance project was completed in record time. Eight volunteers attended this maintenance event to continue work on The Ridge Run Trail. The goal was to finish building a 50 foot section of trail that included some new technical features utilizing the natural terrain. All eight volunteers work hard digging and pulling rocks just as in our last project to build up these technical trail features. The original trail line was maintained running over a rocky section of trail and then making a sweeping turn to exit the area. The new technical line installed runs over the top of two exposed boulders that are buried in the ground. On the uphill side of the trail we installed a berm leading into the entrance of the first boulder and created a secondary berm that leads you into the second boulder. The combination of these additions adds a new level of challenge and flowy fun to the Ridge Run Trail. This trail is now peppered with berms and technical rock features that make it one to session a few times over. I want to extend my personal thanks to each individual (listed below) that took time out of their busy schedule and volunteered to help complete this project. With out this assistance from the riding community, much of the trails we ride would never be maintained. I look forward to see everyone again in future trail builds and or maintenance projects.